If there's one thing I've learnt about life, it's that things are always changing. The only problem is, you sometimes find yourself in a place or a situation where you really don't want things to change at all, but know they have to, or will at some point. It's just one of those things you have to roll with I guess. Was nice not to have to drive four hours north to see Mum this trip. Sure, I'll miss Northland a bit. Especially Cooper's Beach fish and chips! But it's nice having Mum and Ben in Auckland now. Especially after that hellaciously long flight! It was Mum's 60th in January, so I took her to McKechnie Nurseries for some native trees as her birthday present. Closest I've seen her look like a kid in a candy store. But take her to any craft shop and she'll do likewise. The plan is to plant as many natives around the new place as possible. The old swimming pool has been removed and would be a great spot for a little fern grotto. Looking forward to see the bush grow over the coming years. With the move to the new place, it was time to take stock of what I had stored at Mum's. Turns out, it wasn't a lot. A tent, some photos and papers, a little bit of Air Force stuff and some sporting gear. Everything else has found it's way into useful possession elsewhere over the past ten years. Although Mark still has a few of my books, which I mostly read over the summer. Really enjoying trying my hand at various things this summer. Laid some cobblestones, rewired a couple of motorbikes, making glass boxes, started writing a bit more. 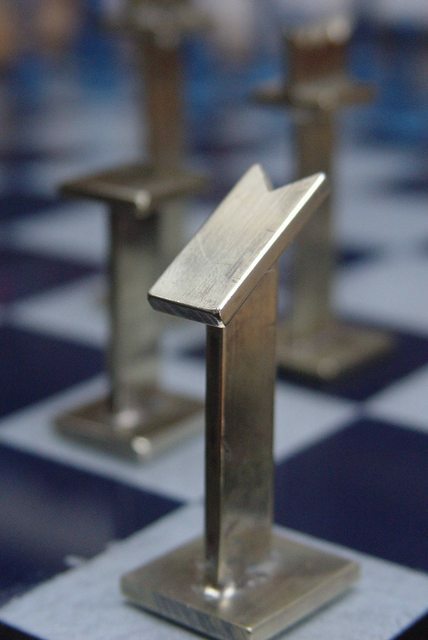 My brother made half a chess set out of nuts and bolts, as well as an amazing board, so I had to make the opposing half. Ended up brazing pieces of bronze together with silver solder to create my pieces and was really chuffed with how they turned out. One of my favourite things was learning how to arc weld. I ended up making a name plaque for someone I cared about. I've since seen some signs made in the same style, but I really had a blast making it. Still feel the need to do more creative things though! Finally got over to Waiheke, even if it was just for a couple of days. What an incredible place! Accommodation was a simple little family Bach. Not much more than a bed and kitchen. Shower is outside and the toilet is down the road. Went and explored Stoney Batter, which is a complex of tunnels and gun emplacements dating back to the 1940's. Was lovely and cool in the tunnels - a nice respite from the hot summer sun! Getting to and from there was fun on the bikes though. It's loose metal for several miles and was actually quite hard going. Also went walking around the bush around Rocky Bay. Stunning beaches and there were some of the original trees which were just phenominal. Most of the bush is second growth, but there are a few giants still standing and they're amazing. The food was incredible too. Went to Te Whau vineyard for lunch and was blown away by both the wine and food. Yeah, it's pricey, but well worth it. That said, even basic cafe food seemed a cut above. I really enjoyed the Beachfront Cafe and Bar in Onetangi. A lovely place to chill out with dinner and a beer in the evening sunshine. Unfortunately, it started getting cool-ish in NZ, so it was time to migrate north once more. Not that I had much of a plan this year, but I was hopeful that a couple of things would pan out in both the work and personal arena. No real trips planned though. Think I was in a kind of limbo perhaps? The Minack Theatre was amazing. And St Micheal's Mount? Just Wow! Love St Ives though. It's definitely the sort of place I'd consider renting an apartment and spending a good few months living there. Loved Portmeor beach. Was amazed at one girl who must've spent an hour playing in the sea. I only managed about 10 minutes before I was frozen solid. Good body-surfing to be had, but definitely needed a wetsuit. Camping was great too. The pitches were massive, which was a good thing, as Dave W had bought a ginormous tent! But the single pitch was big enough for all three tents. And the grass was so nice. Was better than any of the campsites I've used in Europe! One of the things on the agenda this year, was to renovate the apartment. I'd started a few years ago, but short of a bit of preparation and undercoat, I really hadn't progress that far. I guess work got in the way as once I'd started my company I just didn't find any time for DIY. I had some wonderful help (although to be honest, I really didn't do that much) this year to get things moving along at least, and the place is looking pretty good. I've still got a to-do list as long as a very long thing, but I'm hoping to make a decent dent on that when I return from NZ early next year. So to sort out that before it got too out of hand I did three things. Joined the gym, joined the Lido and started focussing on diet. The gym was great. Just a couple of hundred meters down the road and most importantly had three power racks. What I was after was free weights. Specifically, I wanted to do something called Stronglifts 5x5. It's quite a simple program, mostly revolving around squats with ever increasing weights. Doesn't take long before you're lifting some reasonable weight and starting to notice decent changes in your body makeup. I never had a chest before! The Lido was also awesome. I love swimming, but I'm not particularly good at it. However, this year I planned on doing something called Total Immersion. It's a technique I'd read about before and if you look for videos on youtube, you'll see how amazing it is. It really looks effortless, and while I'm not there yet, I'm definitely much improved on technique. I went from barely being able to swim a couple of 50m lengths, through to easily knocking out 1 to 2km in a session. Thirdly, and probably most importantly, was diet. I'm following something call the Slow Carb diet from Tim Ferris's Four Hour Body book. Admittedly, I'm not really following it strictly. If there's something nice at work that has carbs, I'm not really going to avoid it. But I kind of follow the theme. 30 grams of protein in the morning, try to avoid sugars and anything white (bread, rice, pasta). A lot of it isn't anything I've not read about before. Gary Taubes book Good Calories, Bad Calories explores the science behind a lot of the food we eat and why some people get fat. I think that diet has the biggest effect. I've dropped from 84kg to 77kg and feel a lot better for it. On a down note, it's been an emotionally draining few months for me. One where your heart really goes through the wringer and you don't think it could get any worse. But the one benefit from it all, is I found out that I'm able to fall in love once again. Sure, it didn't work out, but that is life. Unfortunately, it all turned a bit sour and I let it affect me more than I liked. I'm normally pretty resilient, but I found it hard to bounce back from this. One lovely event at the end of Summer was the wedding of two very dear friends. I'd been roped in to usher (no idea what that meant), but it was a very well organised affair. Both Andrew and Amelia have an amazing set of friends and I consider myself priviledged to be counted among them. But Doug's delivery was exception too. Maybe it was the stuff I'd been going through as well, but I felt it had gravitas and meaning. Very powerful. A group of us signed up to do a triathlon in Cheltenham . Bit nervous leading up to it. My swim technique was not bad as I'd focussed a lot on improving, so I felt like I'd be competitive at that. And my run time wasn't horrendous. But I was particularly worried after a ride with a couple of people from work. I'd really struggled keeping up with them. Admittedly they were on race bikes and I just had my hybrid, but I honestly felt wrecked. Fortunately Hamish offered to lend me his pride and joy for the event. We'd gone out for a ride a few days before the event and what a difference a bike makes! I absolutely loved riding it and think I'm going to have to get a decent road bike at some stage soon. Nick Slim, the slacker on our team, ended up winning the Triathlon by a handy two minutes. The guy is a machine and it's been great training with him. I ended up about smack bang in the middle of the field. But definitely keen for more. Once I'm back, I'll work out the remaining few days that are left, then get things prepped for heading off as quickly as possible. It does feel a bit like running away, but I need a change of scenery. I also want to start working on a few projects of my own. It's time to see what I can do.